What's a "Normal" A1c? When is it Misleading? Want more information just like this? Hemoglobin A1c (“HbA1c” or just “A1c”) is the standard for measuring blood sugar management in people with diabetes. A1c reflects average blood sugars over 2 to 3 months, and through studies like DCCT and UKPDS, higher A1c levels have been shown to be associated with the risk of certain diabetes complications (eye, kidney, and nerve disease). For every 1% decrease in A1c, there is significant pretection against those complications. However, as an average over a period of months, A1c cannot capture critical information such as time spent in a target range (70-180 mg/dl) and hypoglycemia (less than 70 mg/dl). This article describes why A1c is used in the first place, as well as factors that can lead to misleadingly high or low values. In a follow-up piece, we will discuss time-in-range, hypoglycemia, hyperglycemia, blood sugar variability, and how to measure and interpret them. What is A1c and why is it used? What is a “normal” A1c value for those not diagnosed with diabetes? What is an A1c goal for those with diabetes? Where is A1c misleading or potentially inaccurate? What tools are available if an A1c test is not accurate or sufficient? What’s important to keep in mind about A1c? A1c estimates a person’s average blood sugar levels over a 2 to 3-month span. It is the best measure we have of how well blood glucose is controlled and an indicator of diabetes management. Though A1c doesn’t provide day-to-day information, keeping A1c low has been proven to lower the risk of “microvascular” complications like kidney disease (nephropathy), vision loss (retinopathy), and nerve damage (neuropathy). The relationship between A1c and “macrovascular” complications like heart disease is harder to show in clinical trials, but having high blood sugar is a major risk factor for heart disease. A1c is usually measured in a lab with routine blood work, or with a countertop machine in a doctor’s office (and some pharmacies) using a fingerstick. A1c measures the quantity of “glycated hemoglobin,” which refers to sugar attached to a red blood cell protein called hemoglobin. The number is reported as a percentage of the total hemoglobin in the blood. If a person consistently has higher blood glucose levels over time, A1c levels go up because more red blood cells are coated with sugar. The test is representative of a 2 to 3-month average because once a red blood cell becomes coated with sugar, the link is irreversible. It is only when the red blood cell is "recycled" (happens every 2 to 3 months) that the sugar coating disappears. Make sure you get a regular A1c test, especially if you think you might be at risk for diabetes. What is an A1c goal for those with diagnosed diabetes? An A1c of less than 6.5% or 7% is the goal for many people with diabetes. Since each person with diabetes is unique, however, healthcare providers are recommended to set individual A1c goals. For instance, goals may differ depending on age and other health conditions. Much progress has been made in standardizing and improving the accuracy of the A1c test thanks to the National Glycohemoglobin Standardization Program (NGSP). Results from a non-NGSP certified lab may not be as reliable. 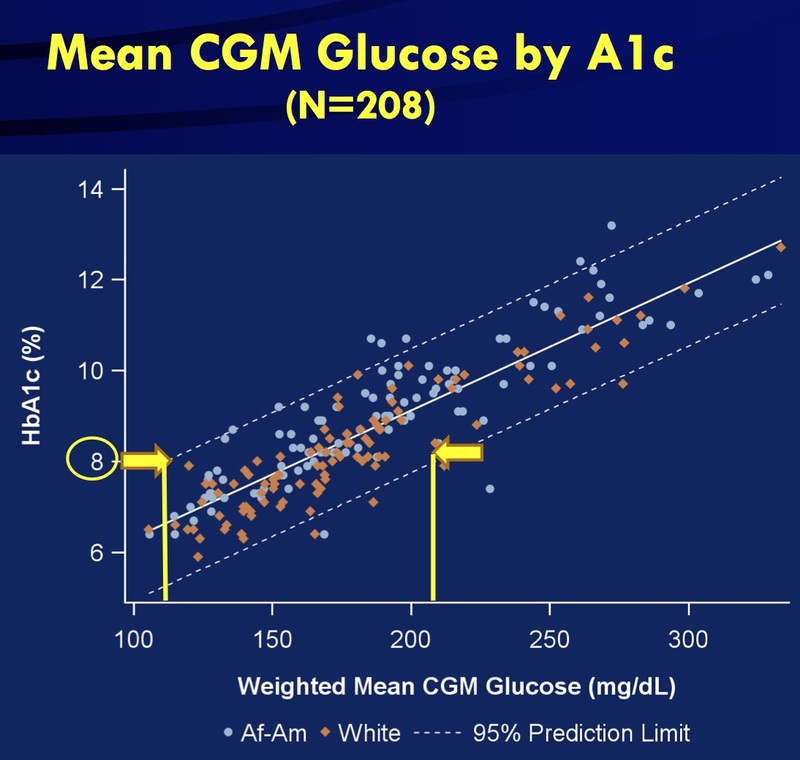 Depending on the machine, a single A1c test can have up to a 0.5% margin of error, which means the “true” value might be 0.5% higher or lower than the measured A1c. For example, if a lab report shows an A1c value of 7.0%, the actual A1c value might range from 6.5% and 7.5%. A1c is based on a person’s red blood cell turnover (the lifespan of a red blood cell) and the quantity of sugar attached to each cell. Certain conditions, such as kidney disease, hemoglobin variants, certain types of anemia, and certain drugs and vitamins, impact red blood cell turnover, leading to misleading A1c values. Click here to jump down to a list of factors that impact A1c. According to Dr. Irl Hirsch, in a typical diabetes practice, an estimated 14%-25% of A1c measurements are misleading. The relationship between A1c values and average blood sugar levels can also vary markedly from person to person. In studies using continuous glucose monitoring (CGM), 24/7 blood sugar levels can be compared to a measured A1c. These studies reveal considerable variation from person to person. For instance, an 8% A1c value in one person could reflect an average blood sugar of 140 mg/dl, while in another it could be 220 mg/dl. This variation relates to individual differences in how red blood cells and blood sugars bind or the lifespan of red blood cells. "An A1c of 8% can correspond to an average blood sugar of 140 mg/dl in one person, while in another it could be 220 mg/dl." For looking at an individual’s glucose values, CGM is a better tool for measuring average sugar levels, time-in-range, and hypoglycemia. Learn more in our previous beyond A1c article here. Besides A1c tests, the most common measures of blood sugar are the oral glucose tolerance test (OGTT), CGM, and self-monitored blood glucose tests. The OGTT is a diagnostic tool diabetes and prediabetes, assessing a person’s response to consuming a fixed amount of sugar. After taking the sugar drink, blood sugar levels are measured two hours later. Below 140 mg/dl is considered “normal,” between 140 mg/dl and 200 mg/dl points to prediabetes or impaired glucose tolerance, and above 200 mg/dl indicates diabetes. It is not useful for tracking diabetes management. If CGM is not available, taking frequent fingersticks with a blood glucose meter – when waking up, before and after meals, and before bed – can also indicate when blood sugar levels are going low, high, and staying in range. If you have diabetes, it’s also important to take the perspective that A1c is not a “grade” on diabetes management, but rather a helpful measurement tool that you and your healthcare providers can use to guide decisions and assess the risk of complications. While there are many unsuspecting factors that can impact A1c, the information in the table below is not meant to invalidate the A1c test. Rather, knowing how certain conditions and factors can change A1c levels is a key part of using A1c as one measure of diabetes management. Many of the conditions that affect A1c results are related to changes in the turnover of red blood cells, and thus notably, types of anemia. Correction of anemia by treatment can also affect A1c results. What is the impact on A1c? Untreated anemia can misleadingly increase A1c values due to decreased production of red blood cells. To test for anemia, ask your healthcare provider about taking a complete blood count (CBC) test. The spleen is involved in the production and removal of red blood cells. Decreased spleen function, which may be caused by surgical removal, congenital disorders, or other blood disorders such as sickle cell disease. This may lead to misleadingly increased A1c. Asplenia can be identified by MRI, echocardiogram, chest X-ray, or a screening test. The body’s response to recent blood loss (create more blood cells) or blood transfusion can misleadingly lower A1c, but the next A1c test should return to a more representative reading. Let your healthcare provider know if you have recently received a blood transfusion. Cirrhosis, in addition to affecting response to glucose-lowering medications – including insulin – may misleadingly lower A1c values. Ask your healthcare provider about a liver examination. Depending on the abnormal form of hemoglobin, hemoglobinopathy can result in either increased or decreased A1c values. Thalassemia can misleadingly lower A1c values due to early destruction of red blood cells. Tell your healthcare provider if you have any known family members that have had thalassemia, and ask for a Complete Blood Count test. Hemolysis may misleadingly lower A1c values due to the shortened red blood cell lifespan. This condition may be caused by an inappropriate immune response and artificial heart valves. 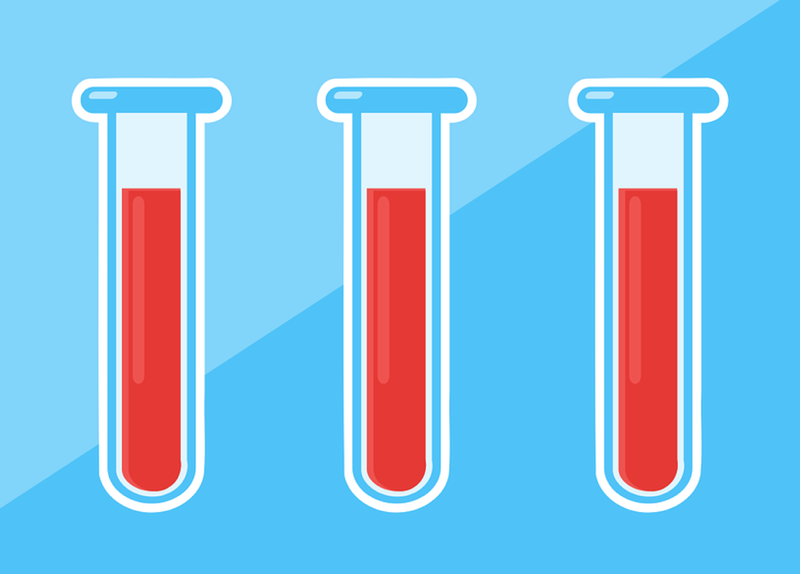 Ask your healthcare provider about taking a Complete Blood Count (CBC) test. Hypothyroidism may misleadingly increase A1c, while treatment with thyroid hormone can lower A1c. Ask your healthcare provider about taking blood tests that measure the level of thyroid-stimulating hormone, which helps determine if there are thyroid gland problems. Decreased red blood cell lifespan and increase in red blood cell production may misleadingly lower A1c values in both early and late pregnancy. Ask about taking an oral glucose tolerance test, which is used to diagnose gestational diabetes. A common practice for pregnant people with diabetes is to use CGM. To learn more about managing diabetes during pregnancy, click here. Untreated uremia may misleadingly increase A1c values. Dialysis is used to treat uremia – in this case, A1c is not a suitable test. Ask your healthcare provider about taking a blood test to detect uremia or abnormal kidney function. Always discuss appropriate use of opioids for pain and their possible effect on A1c as well. Tell your healthcare provider if you are taking any of these medications prior to your A1c test.